I’m a big coffee fan. Truth be told I always have been. My mom would pour me a glass of milk and put a few shots of coffee into it in the morning before middle school and I’ve been hooked ever since. Potentially bad parenting, but some 15 years later it lead to the creation you are currently reading about. 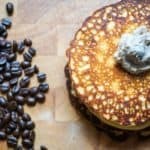 Low Carb Bulletproof Pancakes! Oh, and did I mention these phenomenal coffee cakes are also packed with protein? 10g per bulletproof pancake! Why Are These Beautiful Pancakes Called “Bulletproof”? Most keto-ers are familiar by now with Bulletproof Coffee. Most of the credit along with most of the frivolous claims about the benefits can be linked to Dave Asprey, who’s site can be found here. Now as much as I like to hate on the man for creating mythical “toxins”, he did do something right. This stuff is great! Bulletproof coffee is essentially MCT Oil(or Cocount Oil), Grass-fed Butter, and coffee all combined in a blender. It might sound odd to the uninitiated, but it’s not as weird as it sounds. Most people I give it to for the first time say it tastes pretty good. If you’ve never tried it before I’d encourage you to give it a try. I’ve been incorporating it into my morning routine for the past 6 weeks now and I’m enjoying the extended release of energy I get throughout my workday. Yep, I still have to punch the clock every day… Bulletproof Pancakes aren’t paying the bills yet. Now that you’re more familiar with the bulletproof concept, let’s move on to these pancakes! Getting the right coffee flavor can be a bit tricky. It’s easy to go too light or too heavy, but we’ve done some troubleshooting on these cakes and have got the solution. We’re going with 2 tbsp of espresso and 1/2 tbsp of coffee extract. The espresso can be substituted for normal drip coffee, but you’re going to be missing out on some of the coffee punch. Try to get espresso if at all possible. DO NOT add more than 2 tbsp of drip coffee to try and compensate! This will create a batter that is too runny and you’ll be making crepes, which really isn’t that bad, but still. Pancakes! Coffee extract can be found at most grocery stores. I haven’t experimented with instant coffee yet, but if you want to do some testing feel free. I think it would work out pretty well actually. I’m in the acceptance phase of Bros Anonymous currently. I have a habit of trying to fit some extra protein in wherever possible. That’s why I jammed a full 10g per pancake into these puppies. If you want to get wild and crazy you could substitute vanilla protein here. We’re using good old fashioned unflavored whey. Vanilla will definitely go well with the flavor of these bulletproof pancakes though, even chocolate could work if you’re going for a mocha feel. I’ll probably be trying both variations in the next couple of weeks. Oh silly child, you thought we we’re only making pancakes? Of course we’re going to top these with a Texas Roadhouse style cinnamon butter! It’s super easy, tremendously tasty, and pairs perfectly with the flavor of these bulletproof pancakes. All we’re going to do is combine cinnamon, erythritol(optional for added sweetness), and room temperature butter and mix with a hand mixer for 30 seconds. Simple as that. Put a big scoop on top of your stack and dig in! 2 tbsp Espresso Drip Coffee can be subbed. Get Espresso if possible though! Mix together cream cheese, MCT oil, eggs, coffee, extract and stevia until fully combined. Once skillet is fully heated pour some onto the skillet. You will know it is ready to flip once the top starts to form bubbles!